Can a personality type trigger Hashimoto’s Disease? I take responsibility for triggering my Hashimoto’s Thyroid Disease, Raynaud’s Disease, Osteopenia, early menopause at 36 and pernicious anemia. Yep. I did it to myself, and I have no one else to blame. Autoimmune diseases occur when the immune system makes a mistake and attacks it’s own body, either not creating enough activity or too much. It decreases the ability to fight foreign invaders and also attacks healthy cells by mistake. There is always a genetic component, but that gene needs to be turned on, and boy did I do it. What turns that key to unlock it? Hidden allergens, infections, inflammatory diets, environmental toxins, and stress. In my 30s, when I pushed myself with travel, career, sports, and no-less-than-perfection goals, I put my body in a tailspin and so far down in the well, I wasn’t able to start pulling myself out until it was too late. I’ve written about my story here and here, but in short, my Hashimoto’s Disease symptoms were – menopause at 36, cold all the time, Raynaud’s attacks several times daily, crying for no reason, sleeping about 4-5 hours a night, feeling depressed, losing nearly all of my eyelashes, thinning hair, fatigue, massive blood sugar swings, and brain fog so severe, twice I got in my car and had no idea where I was going. 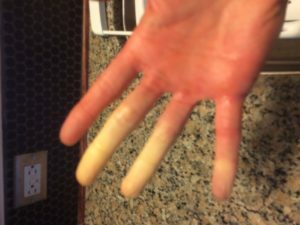 Raynaud’s disease in 50-degree weather with gloves on – ouch! I was an athlete who pushed myself for years in endurance and ultra-endurance sports, pretending they were good for me when anything I was doing to recover was only mitigating the damage I caused. I was a business traveler who survived on sugar and coffee to counteract lack of sleep and time zones. I asked (yes, asked) for a project at work that would give me greater visibility and it ended up being the worse decision I ever made, resulting in being so overworked after a year, I took a demotion and quit, replaced by four people within one month. Is it a personality thing? My personality has always involved setting very high standards for myself. Setting goals, reaching them and then placing even higher ones before celebrating or acknowledging what I had done. This isn’t always a bad thing, as for many people, it’s the challenge of the goal that brings them satisfaction and fulfillment. That’s me, but once I reached those goals, I just shot higher, instead of asking myself if the next goal was important or relevant, rather than just seeming like the next logical step. People would describe me as Type A (Type Awesome!) and lazy or complacent would never be used to describe me. What I was missing was contentment. I drove myself so hard I never even took a breath to let myself soak in what I had done and reflect. Over the last four years, dealing with the symptoms of Hashimoto thyroid disease, I have changed so much beyond diet and exercise, meditation, and stress relievers. I am continually pausing, reflecting and asking myself what my goals are and if they’re mine or someone else’s. Do they make sense at this time? How will it affect my health and happiness? I’m so passionate about working with high-achievers, especially those that are suffering from Hashimoto’s or other autoimmune diseases, that I took over 40 hours of training and am currently even in year-long gut health and microbiome course to be a better coach. I want people to set goals to be super, without thinking they have to be a Superhero. Watch the recording of Marcey’s webinar on how to Work Well and Play More with Hashimoto’s Disease.